I was intrigued by the following report by Kelly Ng that appeared in State Media’s Today Online a few days back. SINGAPORE — A day after a High Court raised the red flag on the goings-on in Aljunied-Hougang-Punggol East Town Council (AHPETC), Law Minister K Shanmugam followed up with hard-hitting words for the Workers’ Party, which runs the town council. The scathing comments Justice Quentin Loh directed at AHPETC confirms his remarks previously that AHPETC’s town councillors had acted in an “unlawful” manner, said Mr Shanmugam, who is also Foreign Minister. He also zeroed in on the fact that the judge had highlighted AHPETC chairman Sylvia Lim’s misleading statements to Parliament about the financial transfers the town council was required to make. Yet every year the Finance Minister presents a Budget that could be called seriously misleading. It excludes most of the earnings on past surpluses apart from the Net Investment Returns Contribution? Although the overall Budget balance for 2015 showed an estimated deficit of $6.67 billion this was entirely due to capital transfers to endowments and trust funds of $6 billion.These should not count as current spending. In the previous year there was a transfer of $8 billion supposedly to fund the Pioneer Generation Package but actual spending on the Pioneer Generation in 2014 was only around $230 million and it was funded out of current revenue. The true surplus is of the order of $25-30 billion a year once land sales, capital receipts, dividends and interest and investment income is added in and this is still probably an underestimate as it represents the Government surplus and not the General Government surplus. The latter is a wider definition to include the earnings of all Government companies and not just dividends and investment income paid to the Government . The setting up of new funds is particularly worrying as there seems to be no accountability to Parliament for many of the biggest of these funds once the monies are transferred. In particular I have expressed my concerns about the National Productivity Fund (NPF) which was set up by separate Act of Parliament in 2010. The Finance Minister has allocated a total of $3.5 billion to the NPF since 2010 but it does not appear in the last published annual Statement of Assets and Liabilities which the Finance Minister is required to publish this every year with the Budget. Neither does the Bus Services Enhancement Fund or the Special Employment Credit Fund. Despite it being a legal requirement to present the NPF accounts to Parliament there is no record of it in Hansard. Neither have I seen any accounts or even an Act setting up the Special Employment Credit Fund (SECF). Legislation setting up the Bus Services Expansion Fund (BSEF) was added to the Land Transport Authority Act in 2012 but there is no requirement to keep accounts and I am concerned that the Finance Minister seems to be allocating more money to purchase buses in this year’s Budget without explaining how the first $1.1 billion has been spent. I wrote an open letter to the Finance Minister on 21 April 2015 asking him to answer these anomalies. If the Finance Minister has breached the Constitution by failing to pass separate legislation for every fund he has set up and furthermore has failed to include significant funds in the Statement of Assets and Liabilities, he has acted in an unlawful manner. This is even more true if he has failed to lay the accounts of some of the funds, such as the NPF , before Parliament as required under the Act. I would be happy to learn that I am simply mistaken and that the answer lies buried in Hansard somewhere. In that case why does the Ministry not simply respond with a clarification? As the PAP will be sure never to publish my letters to them I suggest that you share it as many times as you can in the social and alternative media. 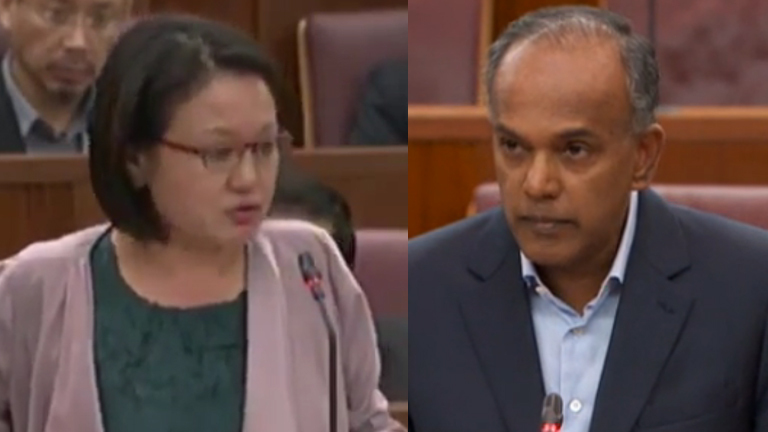 In the video referred to above, Shanmugam is scathing about the lateness of the AHPETC accounts. But why is he not similarly scathing about the Finance Minister’s failure to publish the NPF, BSEF, SECF or National Research Fund accounts or present them to Parliament. Today was not the first time Mr Shanmugam has, shorn of parliamentary privilege, described the WP town councillors’ conduct as unlawful. Parliamentary privilege refers to the legal immunity from any action in the courts for words spoken in the course of parliamentary proceedings. The aim is to allow Members to speak freely and frankly without fear of legal consequences. Note Shanmugam’s use of the word “unlawful” rather than “illegal”. He sounds scathing but has yet to cite an actual law that has been broken. Either the Government should charge the WP MPs and allow them to defend themselves in court or keep quiet. Continually referring to “egregious conduct that must be punished” is just smear tactics. In an 80-page judgment released on yesterday, Justice Loh had said that AHPETC’s actions were “at the height of financial irresponsibility”, quoted Mr Shanmugam. No, the height of financial irresponsibility and a Constitutional breach is to produce a statement purporting to show the assets and liabilities of Singapore but which is two years out of date and presented with so little in the way of explanation that it could be termed grossly misleading. The $833 billion of assets shown cannot possibly be correct as I will demonstrate in my next blog. Either there are substantial hidden assets or the Government has lost a lot of money through poor investments or worse. There is a simpler proof that the Constitution has been breached. Under Article 147 -(4) (b) the Finance Minister is required to present an audited statement as at the end of the last completed financial year to Parliament. This means that when he put Budget 2015 before Parliament he should have provided a statement at the end of March 2014. However the statement he provided was only up to 31 March 2013. The judgment underscores the fact that action should be taken over the “egregious conduct” of the AHPETC, he added, highlighting that the judge had said the conduct was “possibly criminal” and that the town council could be sued by residents and the Housing and Development Board. Again “possibly criminal’ and “egregious conduct” are just smears. Either the WP MPs’ conduct is criminal in which case they should and must be charged or it is not. I am surprised that the judge Quentin Loh, who was one of the Appeal Judges in my IMF suit, seems to have overreached himself in his remarks and not confined himself merely to the issue before him. Shanmugam clearly has a very short memory because he forgets the Lehman minibonds saga when two PAP run Town Councils, Holland-Bukit Timah (HBKTTC) and Pasir Ris-Punggol Town Councils (PRPTC), lost 6.7% and 2.7% respectively of their sinking funds in unsuitable investments in structured products issued by Lehman Brothers and Merrill Lynch. While these investments fell well within the limits for investments in securities other than those issued by the Singapore Government of 35% of the sinking fund, the Town Councils concerned broke the spirit if not the letter of the MND guidelines. These state that investments in foreign currencies are to be for hedging purposes only. While the Lehmans Minibonds and Merrill Lynch Notes may have been denominated in Singapore $ the underlying collateral consisted of foreign currency debt obligations of foreign companies and governments such as Icelandic bank debt. They thus involved substantial currency risk as well as credit risk that the Councils did not have the expertise to assess. Did the HBKTTC and PRPTC take the advice of a qualified person as they were required to do under the Town Council Financial Rules? There was no proper public investigation of what induced the TCs to put so much of the sinking funds in such risky products nor whether there were inducements or entertainment offered to TC officers in defiance of accepted compliance standards to place so much of their sinking funds into such risky products. Perhaps Shanmugam expects Singaporeans have forgotten the Hotel Properties Limited (HPL) saga in 1995 but much worse things happened at a public company. Numerous members of the Lee family, including Lee Kuan Yew, Lee Hsien Loong, Lee Hsien Yang and Lee Wei Ling bought multiple units in two new luxury condominiums at substantial discounts to the asking price. These discounts were not divulged to the shareholders or their approval sought and were not available to the public. You can read about it here. Lee Kuan Yew’s younger brother, Lee Suan Yew, was on the board. The Lee family treated it as their own private company without regard to the rights of shareholders. The discounts were not even disclosed until the Stock Exchange (SES) forced HPL to disclose them. The SES forced HPL belatedly to seek shareholder approval and Lee Kuan Yew and his son paid back the discounts they had received. That was a related party transaction that should have been disclosed. However this should not be the end of the story. Under the Prevention of Corruption Act Article 8 states that there is the presumption of corruption if any gratification is received by someone in the employ of the Government from anyone who seeks to have or has any dealings with the Government. As a property development company HPL certainly had significant dealings with the Government. In addition to this example there are many egregious conflicts of interest and use of public resources by the Lees and other PAP Ministers that go unchallenged. I wrote about the conflict of interest in having the Prime Minister’s wife as head of Temasek here. Presumably he approves her remuneration even though the Government says it is not in the public interest for Parliament or Singaporeans to be told what it is. There is also the fact that much of the conveyancing business from HDB purchases went to Lee and Lee, which was headed by LKY’s wife. LKY commandeered an SIA aircraft to fly her back when she fell ill in London even though she had no official position and gave her a state funeral. The judge also noted that “it is clear there are grave and serious questions” in AHPETC, relating to its books and the validity and property of payments made to related parties. I am still waiting for answers to the questions I have raised over the Government’s finances. When does the MOF ever answer grave and serious questions? Do you all remember the IMF loan case? Rather than answer my contention that the Government had broken the Constitution the AG shifted it to a question of whether a private citizen could sue the government. The court ruled that I had no locus standii. Therefore the substantive issue was not fullly heard and I was denied the opportunity of arguing it as fully as it should have been. i have raised grave and serious questions since then. My concerns over the misleading and inadequate nature of our Budget presentations were serious enough for Huffington Post to publish (see here) but not state media. Mr Shanmugam said MND will consult the Attorney-General’s Chambers on its next steps, but said the Government has a responsibility to pursue further action. The Government dear people has the responsibility to answer me. I have raised serious concerns – see my stuff above about how I would love to know that the answer is in Hansard and I am mistaken but …. Reiterating that the judgment concurs with the government’s position that AHPETC’s conduct “was bad … and actionable”, Mr Shanmugam said the judge was of the view that the Town Councils Act empower the HDB and residents, not MND, to seek legal action. But the PAP Ministers break the law with impunity and consider obeying the Constitution optional. We have no rule of law. This is because the people have no voice and Parliament is reduced to a rubber stamp. The Town Council Act was devised by the PAP as another barrier to the election of Opposition MPs. By forcing MPs to be primarily estate managers they prevent Opposition MPs from fulfilling their primary role which should be to hold the Government to account. Town Councils should be directly elected by the residents rather than the current conflict of interest where MPs both run the Town Councils and are supposed to help their residents get their complaints and problems resolved. “That is something the Attorney-General will advise us on, as to whether it is the correct interpretation, and what they should do about it,” he said. So stop smearing and get on with it as we would like to see this in open court where WP’s answers cannot be cut from public view. The PAPy controlled govt is, and has been, saturated with hypocrisy and half-truths, but 60 of the population have largely remained unaware of such deficiencies but are slowly realizing how blind they have been, in the past.